On September 26, Mr. Masataka Fujita, Secretary General of the ASEAN-Japan Centre (AJC) had a bilateral meeting with H.E. 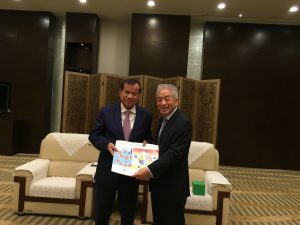 Mr. Thong Khon, Minister of Tourism, Kingdom of Cambodia while he attended the “2018 ASEAN “the Belt and Road” Tourism Culture Exchange Week” in Guiyang, China co-hosted by the ASEAN-China Centre (ACC) and the Guizhou Provincial People’s Government. H.E. Mr. Thong Khon expressed his gratitude to the AJC’s programs to promote Cambodian tourism in Japan, then shared his views on the future promotions. As a host country of SEA Games in 2023, H.E. Mr. Thong Khon showed a high interest in the Olympic Games in Tokyo in 2020, and exchanges of athletes between Cambodia and Japan. 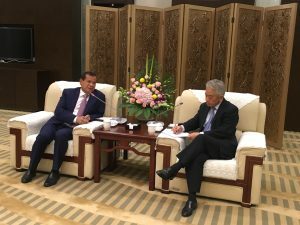 SG Fujita noted that the AJC will continue to work closely with the Ministry of Tourism of Cambodia, to further promote the people-to-people exchanges between the two countries. H. E. Mr. Thong Khon, Minister of Tourism of Kingdom of Cambodia and Mr. Masataka Fujita, Secretary General of the ASEAN-Japan Centre.